Can Shiitake Mushrooms Be Eaten Raw? Traditional to Asian cuisines, shiitake mushrooms are beloved by omnivores and vegetarians alike. Their dense, meaty texture makes them a good substitute for meat in some dishes, and their distinctive taste lends depth to simple dishes, such as grilled steak. Shiitake mushrooms can be purchased fresh or dried in high end grocery stores and health food stores. They are also widely available dried in Asian groceries. Fresh shiitake mushrooms can be eaten raw, but many people don't think this is possible because they are commonly sold dried. While dried shiitake mushrooms are similar nutritionally to their fresh counterparts, their flavor is more pronounced and they need to be soaked in water before being eaten. Fresh shiitake mushrooms have a more delicate texture than dried ones, and their flavor, while still strong, is less pronounced. To use raw shiitakes, you need to clean the mushrooms of debris and dirt first. Place the mushrooms under running water and use a paper towel or soft brush to gently brush off the dirt. The stems of the shiitake mushroom are stringier and harder than the cap, and you can cut off the bottom half of the stem — or the entire stem — to make the mushrooms easier to eat. Slice the mushrooms into thin strips and scatter them over a salad or a plate of fresh nachos for extra nutrition and a boost in flavor. A 100 gram serving of fresh shiitake mushrooms has 34 calories and no fat or cholesterol. It also contains 7 grams of carbohydrates, including 2.5 grams of dietary fiber and 2 grams of protein. This provides 2 percent of the daily value of carbohydrates, 12 percent of the DV of dietary fiber and 5 percent of the DV of protein for those on a 2,000 calorie per day diet. A single serving also has 2 grams of sugar per serving and 2 percent of the DV of iron for a 2,000 calorie per day diet. If fresh shiitake mushrooms aren't available, dried shiitake mushrooms are available year round in health food and Asian grocery stores. In some cases, chain supermarkets will also have small packages of dried shiitakes. 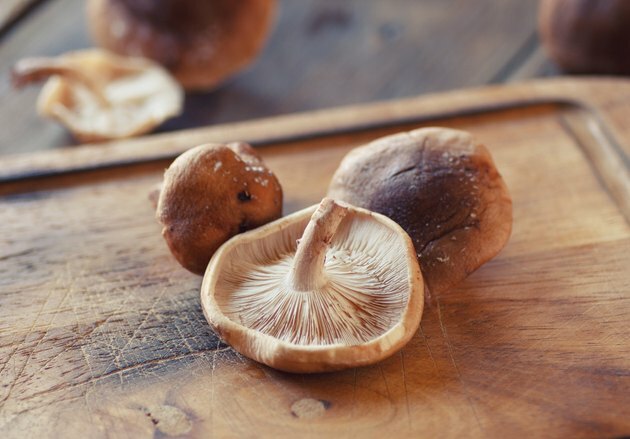 Containing the same nutritional value as fresh shiitake mushrooms, dried shiitakes need to be soaked in warm water until they are soft before they can be used. Often meatier than fresh, dried shiitakes can be chopped and added to stir fries, soups and stews. Mixing dried or fresh shiitake mushrooms with grains and spices makes for a rich-tasting stuffing. Use the water from soaking the shiitakes to make a soup, as it will add extra depth to the final dish.